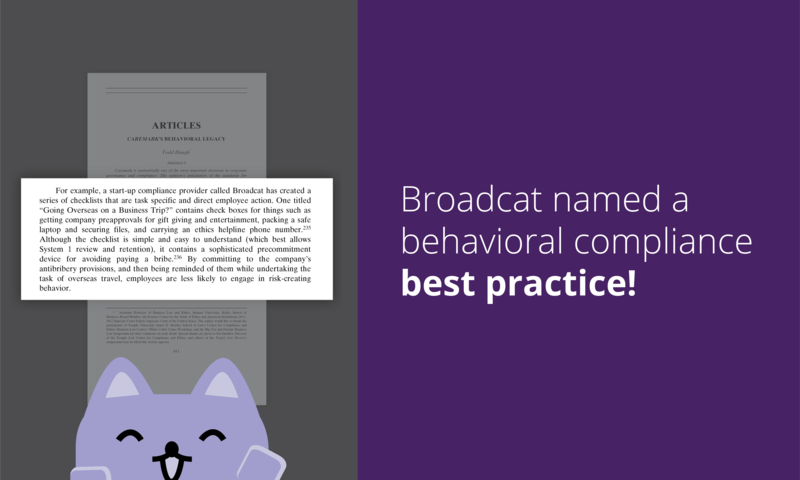 Broadcat named a behavioral compliance best practice! Hey, check it out: our approach—and one of our job aids specifically—was named a behavioral compliance best practice! And by an academic journal, so it's legit! Specifically, the Temple Law Review. Our work is included in Caremark's Behavioral Legacy, an article by Todd Haugh from Indiana University's business school, as an example of a behavioral compliance best practice for our task-specific checklists. 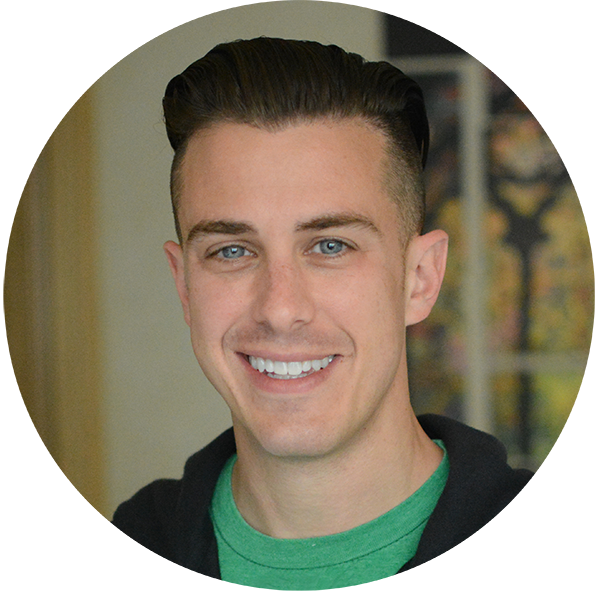 For example, a start-up compliance provider called Broadcat has created a series of checklists that are task specific and direct employee action. One titled “Going Overseas on a Business Trip?” contains check boxes for things such as getting company preapprovals for gift giving and entertainment, packing a safe laptop and securing files, and carrying an ethics helpline phone number. Although the checklist is simple and easy to understand (which best allows System 1 review and retention), it contains a sophisticated precommitment device for avoiding paying a bribe. By committing to the company’s antibribery provisions, and then being reminded of them while undertaking the task of overseas travel, employees are less likely to engage in risk-creating behavior. And by the way: you can get that "Going Overseas on a Business Trip?" job aid that he mentions, along with 60+ others, by joining Broadcat for Champions. That's what we do, and there's more on that here. And here are two reasons why you should read the entire article, even if you're not the type of weirdo who reads social science studies on SSRN on your phone for fun, which I'm not saying I do (but I do). 1. If you work in compliance, you should understand Caremark. Caremark is why your board cares about compliance. Or, at least, why boards started to care about compliance back in the day. It's the case that gave birth to their duty of oversight—and even though later cases have given more shape to the doctrine, it's still the seminal case. And if you deal with your board at all, you need to understand it at least a little to be able to sort through the sound and fury of what boards "should" do and what they actually "need" to do. That includes understanding how Caremark is simultaneously incredibly powerful and hilariously weak, because it's driven a huge amount of hype and change while not actually saying all that much; the actual standard for oversight liability is really quite low. Understanding this will let you make sense of what your board's obligations really are, while at the same time knowing when to call BS on vendor hype about what boards "need" to do—both of which will help you speak with credibility and authority on the issue. Haugh unpacks this in an accessible way, including a nice overview of the case itself. So whether you got into compliance by way of Caremark (like me!) or are hearing of it for the first time, you'll get something worthwhile. 2. You should know what other techniques to use. Second, note that our approach is a behavioral compliance best practice. Not the only best practice, as behavioral science is kind of a big field and there are a bunch of techniques here. We specialize in a technique Haugh describes as precommitment devices, and we blend some elements of priming or accountability debiasing in there, too. Practically, that means we make really good checklists, flowcharts and other job aids to be used as reminders at critical points—like how a pilot flies a plane. They make the ethics and compliance decision obvious and explain what to do, so people don't rationalize or skip over it due to the everyday biases and busyness we all have. But again: that is one technique. You should use it, but there are no silver bullets, so you should know what else to do, too. And Haugh does a nice job of laying those out, including a broader discussion of priming, storytelling, and incentives with examples from some in-house programs. Even if the Caremark thing isn't your jam, read that—the behavioral best-practice section starts on page 638 of the article and it's worth your time.